With its quick and easy clamp-on transducer installation, factory pre-configuration and user programmable menu driven interface, the ultrasonic flow meters are a snap to commission in the field. The reliable FM500 ultrasonic flow meters use custom algorithms and DSP technology to ensure high accuracy flow metering, and the proprietary AGC (Automatic Gain Control) algorithm eliminates the need for manual gain adjustments. Optional features include: three configurable relay outputs and a communications package that allows the ultrasonic flow meter to connect to your computer via RS-232, RS-485, USB or Ethernet. 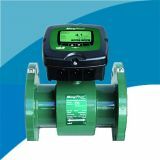 The ultrasonic flow meter's communication package also permits remote access and control of all functions including real-time display, system configuration, data logging, remote data capture and process control functions. The software included with the ultrasonic flow meter's communication package allows remote internet access through a local network set-up. 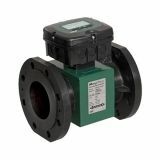 The Sonic-Pro series Hybrid Ultrasonic Flow Meters can measure fluid flow in virtually any fluid in which sound waves can travel. The Ultrasonic Flow Meters are considered "hybrid" because they can measure fluid flow using either the Doppler or Transit Time methods. 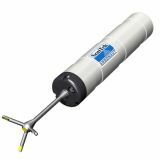 The Sonic-Pro ultrasonic flow meter's sound transducers are clamped to the outside of the pipe wall and include no moving parts. This method of flow measurement is safe, non-intrusive and very easy to service. The Ultrasonic Flow Meter's Doppler measurement method requires particles be present in the flow stream to "reflect" the sound waves. 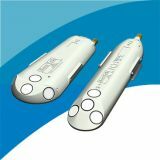 The ultrasonic flow meter may not read flow correctly when using the Doppler mode if the fluid contains no particles. 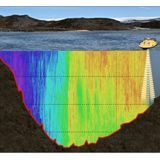 For best results 0.02% to 15% (200 to 150,00 ppm) particles should be present in the flow stream. The Ultrasonic Flow Meter's Transit Time measuring method requires relatively "clean" fluid to enable the sound waves to complete their circuit. 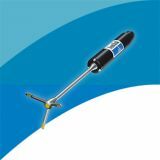 The Ultrasonic Flow Meters may be operated in the Transit-Time mode when the fluid contains 0% to 10% (0 to 100,000 ppm) of particles. 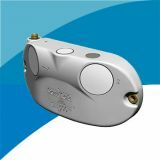 To allow for changes in the fluid's particle count, the Sonic-Pro Ultrasonic Flow Meters monitor the signal gain and employ an Automatic Gain Control (AGC) algorithm that periodically adjusts the gain to maintain the optimum power level. The speed at which sound travels in the fluid must be known. The factory will configure the ultrasonic flow meter for a known fluid during the initial configuration. 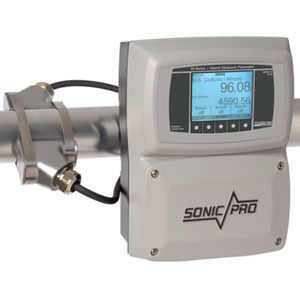 The Sonic-Pro Ultrasonic Flow Meters include a 5-button user interface that can be used to configure the meter. Many common fluids are listed in The Ultrasonic Flow Meter's software and can be selected directly from the menu. Provided the speed of sound in the fluid is known, custom "unknown" fluids can be input into the ultrasonic flow meters manually by the user. A list of various fluids and their sound speeds are provided in the ultrasonic flow meter's user manual.